runs on top of Erlang VM. and implementation etc. of the Jet language. • CRuby (MRI) has Global Interpreter Lock (GIL). The languages work on Erlang VM (BEAM). Erlang VM (BEAM) supports concurrency. as open source in 1998. • All data structures are immutable data. • The processing of closing inside an actor is thread-safe (actor-safe?）. • Erlang's process is lightweight and like an actor on actor model. • Each process queues messages from other processes. • BEAM's GC is independent in each process. • If a process crashes, it does not affect other processes. • Erlang language is a language derived from Prolog. difficult for major language users. • Variables are capitalized beginnings. using commas, semicolons, and periods. Erlang VM (BEAM) supports concurrent programming. class instance is a process. object oriented programming and concurrency. 2. Jet inherits my favorite Ruby’s features. inherits some features from Ruby. 4. Jet has heigh level interface for concurrency. • Module is just a erlang’s module. • Operator overloading is not supported. # You can omit “erlang::”. # Single jet file contains single module. Nothing can’t be written outside of a module. # Nothing can’t be written outside of a module. • Erlang code can be called from Jet with zero-overhead. 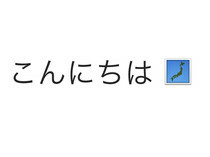 Jet's syntax is Ruby-like syntax. • Ruby supports for class inheritance. inheritance. Either one may be enough. • Block is just a closure (anonymous function). obj = Demo::DemoActor.spawn # DemoActor hasn’t “new” method. Method definitions in a class definition is defined as a function in an Erlang module. A class instance (object) is represented as a triple tuple (fixed length array). check the type of the element. runtime gets it from the process dictionary. then cache it in the process dictionary. method table and empty status. calling the instance's initialize method. normal method call), not a message transmission by ghost method. messages, waiting for call result acquisition will last forever. calls and method calls are large. • Dialyzer is a static analysis tool that detects type errors. • Dialyzer supports Erlang source code or AST (ASF). • Jet compiler generates Erlang AST. • Therefore I think that it is easy for Jet to support Dialyzer. specification by participating in its development. • The background image of the second page was acquired from Wikipedia (Wikimedia). • The author is https://commons.wikimedia.org/wiki/User:Kakidai. 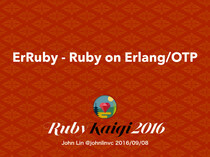 • ERLANG is a trademark or registered trademark of Telefonaktiebolaget LM Ericsson. • I customized https://github.com/shoya140/zebra and used it.